The Internet is growing exponentially every day, and with the internet is growing human interaction with various digital technologies which aim to make everyone’s life simple and easy. There is always a streak to utilize the internet and invent something that makes our lives much easier. The increasing interaction of humans with internet calls for the SMB owners to harness this invaluable relationship to grow their business. This ‘human-internet’ relationship is quite complex and widespread in the form of everyday digital devices like mobiles and smart speakers, and digital techniques like digital marketing, upon which a common human relies upon for survival in today’s era. Now the question arises that what can SMB owners do to utilize the so-called digitalization to grow their business? Well, it isn’t going to be easy but they can concentrate on a few ongoing digital trends that most business owners follow to grow their business. Business owners can set aside some marketing budget to be spent on new digital marketing techniques like influencer marketing. With the outburst of smartphones, it becomes essential for all business owners to provide their customers with a smooth and engaging mobile experience so that they can interact with their businesses without any hassle. Everyone wants to be treated specially. SMB owners need to build dynamic websites which store customer’s details and behavior and then serve the content they love the most. Personalized marketing strategies have always been known to generate positive ROI. Advanced data tracking facilitates in-depth analysis which can be very helpful in figuring out the causes for failed online conversions. A data scientist can be of immense help here. Data tracking also helps decision-makers to focus on the narrower end of the sales funnel. Digital devices like VR headsets and smartwatches can help build tailored experiences for customers. Mobile apps are an effective way to strengthen relationships with existing clients. Every SMB owner wants to match up the pace with which the digital cosmos is expanding. However, it is a tough task as the technology is advancing every day and when combined with endless human creativity it develops new digital masterpieces every now and then. So no one can linger on ongoing and trusted trendsetters and also cannot ascertain what the next masterpiece could be. 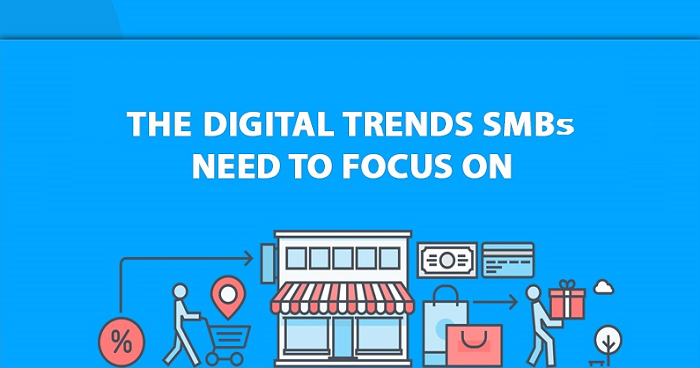 So Maiden Stride brings you the recent digital trends that every SMB owner can focus on to grow their business at least and can generate more leads.